Lords of Time is a fantasy RPG with a science fiction framing story. 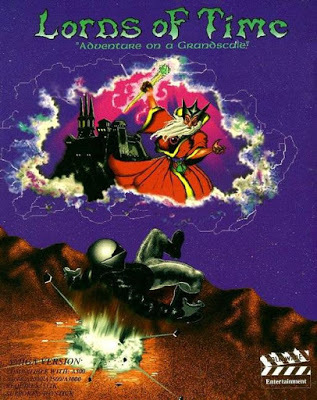 A character called “Major Thom” tries to find a way back to Earth after an aerospace accident deposits him in a fantasy kingdom called The Realm. 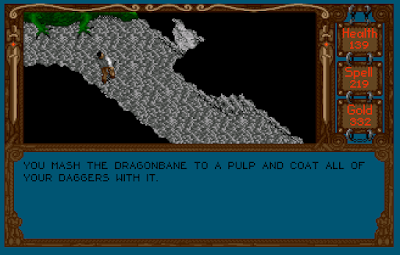 The game uses an update of the Faery Tale Adventure engine with an axonometric interface, action-oriented combat, experience-based leveling, and a day/night cycle that force the player to manage hunger and fatigue. 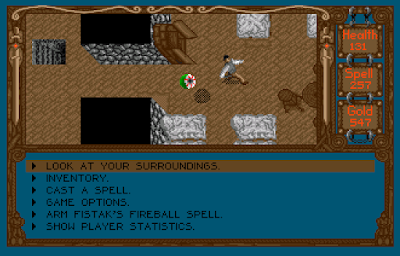 Adventure game-style inventory puzzles carry the player across multiple episodes as he uncovers the lore of The Realm. The game has some fun moments, but a horrible combat system and threadbare story ultimately hurt this one. Lords of Time is a 12-hour game that manages to double its duration by making it unclear what you need to do next. 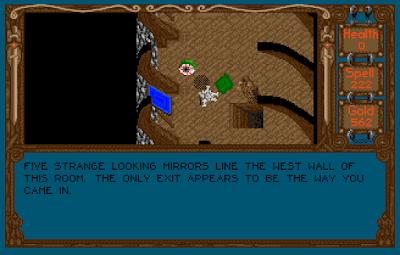 Its open game world is a bit of an illusion because to actually solve the plot, the player has to visit places in a specific order. This results in a lot of backtracking, and because of the relentless spawning of enemies, backtracking in this game–actually, even just “tracking”–is an exercise in frustration. In previous entries, we saw how much random exploration I had to do to advance between points that would have taken but minutes with a walkthrough. Crossing the ocean as a wyvern. The same dynamic was at play in the final episodes. I could have won in two hours with some foreknowledge; instead, it took me about five. In the previous entries, I had received the jeweled key to the island keep from the dwarf king and the “Mage Nullification Spell” from the Druid Temple. I saw no reason not to go right for the island keep. 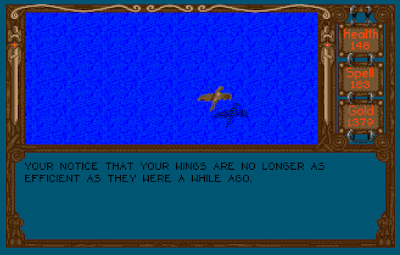 I used the “Wyvern Morphing” spell to cross a strait at the north end of the map and fly to the only island where the “island keep” could possibly be located. There were two sets of mountains on the island. One had a bunch of windows but no entry point. It looked pretty cool, though. The second had a large door that opened with the jeweled key. 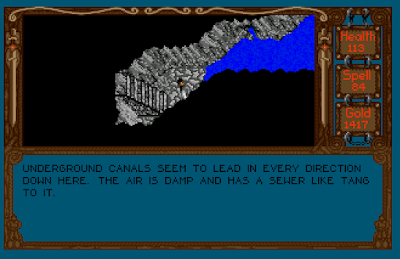 It led to an underground area full of water. Unfortunately, the only paths forward were blocked by locked gates, and no keys I had (nor my lockpicking ability) would open them. “Sewer-like tang” is an unpleasant phrase. Sighing, I returned to the mainland and messed around a bit while figuring out my next move. Around this time, I tried a commenter’s suggestion to cast “Portal Activation Spell” on one of the little shrines I’d encountered. It worked. 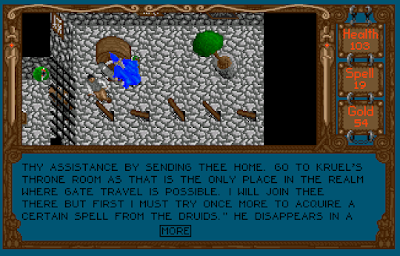 The spell moves the character among four shrines: one on the north coast, one on the south coast, one on the west coast, and one outside Castleguard. These shrines made it a lot faster to move around the map. Between them and “Wyvern Morphing,” I bypassed a lot of the frustration with random combats. Activating the portal at one of the shrines. Consulting my notes, I realized that the only lead I hadn’t pursued involved using dragonsbane to deal with the previously-encountered dragon. My notes said that I discovered its cave on Wyvern Mountain, but after crawling all over the mountain for about an hour to no avail, I realized I must have made a mistake. Sure enough, I found the cave a few klicks to the west, at the base of the dwarven mountain. As I entered, I donned the Druid Cloak, thinking it might protect against the dragon’s breath. I then opened my satchel and grabbed a handful of dragonsbane. The game asked what I wanted to apply it to. I said my sword. It said that the goop just slid off. I tried again and specified my homing daggers. Again, the attempt was fruitless. No other weapon worked either. 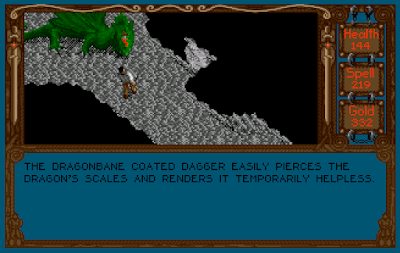 It turns out that the dragonsbane–for no sensible reason–only works with regular daggers, and I had sold or dropped all of mine. Meanwhile, the cloak did protect me, but the dragon proved immune to every other weapon or spell. What if I wanted his head? The slimy key–of course–turned out to open those grates in the caverns below the island keep, but it really doesn’t make any sense that the dragon would have had it. 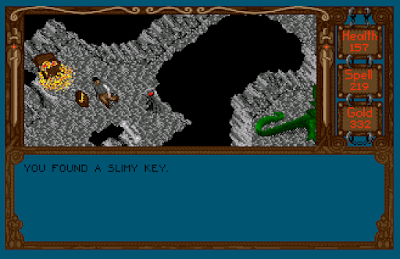 The game has another surprise up its sleeve when it comes to the slimy key: it only works three times, after which it crumbles away. There are more than three grates in the island keep caverns. If you use it on the “wrong” doors–which of course there’s no way to tell–you enter a walking dead state and you have to reload from outside and try again. I hope that was the last time I needed it! Ultimately, I found my way through. The caverns led up to a dungeon full of cells and a torture chamber. New enemies appeared, including slimes and floating eyes. 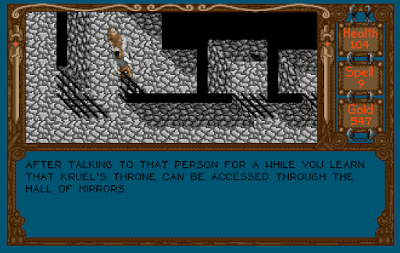 Skeleton keys unlocked the prison cells (fortunately, I’d bought a bunch in some previous session), and from the prisoners I learned that the wizard Kruel was occupying the tower above, and that I could reach him from the “mirror room” via the fourth mirror from the north. Freeing a prisoner in Kruel’s dungeon. I couldn’t find anything to do in the torture room, even though there were some interesting graphics of some prisoners in stocks and one on a torture rack. As we’ll see, I should have tried harder. The level above the dungeon had several cabinets and beds along with wandering enemies. There wasn’t much to do here, but I appreciated the ability to sleep. In the level above that, I found the mirror room. Following the prisoner’s instructions, I looked at the fourth mirror from the north end of the room, and was sucked through (a one-way trip) into Kruel’s lair. A flying eyeball and a slime killed me while I took this screenshot. The game told me that the spell uses concepts I didn’t understand. I messed around a bit more, trying different spells, poison, and so forth, but I couldn’t find anything that would defeat Kruel. How come I don’t have that spell? I don’t know why I made this assumption, but what I assumed was that my character hadn’t taken “Advanced Spellcasting” at the guild in Castleguard. I mean, I know I had taken it–I had a screenshot and everything–but I assumed that something must have caused me to reload after taking it, and that I had forgotten to take it again. Sighing, I reloaded from outside the keep, flew back to the mainland, returned to Castleguard, and took the course again. I still couldn’t cast the spell. Now I was lost again. 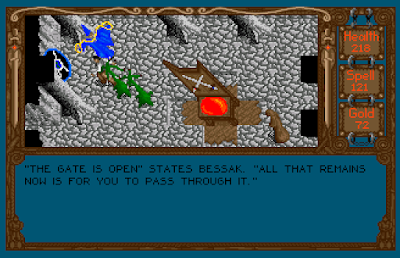 I ended up revisiting several places, including Bessak’s Keep and the king’s castle, just to see if anything changed. 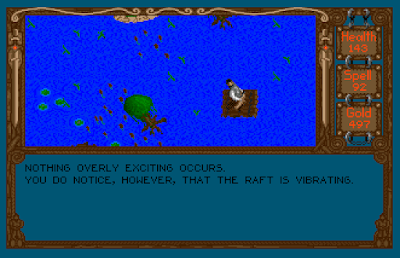 Down in Murkvale, I realized I’d never rented the raft or gotten the two raft propulsion spells that makes it move. This all turned out to be a waste of time, and I’m still not sure what purpose the raft serves since you can just wade through the water between the islands. After a long time, I decided I must have missed something in the lower parts of the island keep, so I returned to try again. This time, I realized that the figure on the torture wheel must in fact be Bessak, and that the five sticks in the ground south of him, which I had regarded as some kind of fence or barrier, were actually levers that I needed to manipulate to stop the wheel. Each of five levers had three positions, and it took me a while to find the right combination. I think you’re supposed to watch their effect on the wheel–some of them slow the wheel down, some speed it up–and discern the combination accordingly. The change in speed is hard to perceive. I just made a list of the 3^5 = 243 possibilities and worked my way through them, getting the correct combination when the list was half done. Bessak crawled off the wheel, thanked me for my help, and said that he’d help me get home. He told me he’d meet me in Kruel’s throne room after he got a “certain spell from the Druids,” taking off before I could tell him I already had the spell. Back I went to the throne room. 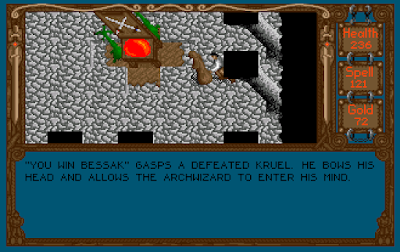 This time, Bessak appeared in the northwest corner and started casting spells at Kruel. The two locked in their magic duel while I accomplished nothing fighting endlessly-spawning demons and gulping potions. Finally, I ran up to Bessak and the game offered me the ability to give him something. I gave him the “Mage Annulment” spell. After that, I ran over to Kruel and began attacking him. I don’t know whether my attacks brought an end to the battle or whether I just had to wait a certain amount of time, but eventually Kruel admitted defeat. The lack of a comma suggests a big change in my quest reward. Bessak opened a portal and I ran through. Did he just choose a “default” world? I thus awoke on a rocky landscape with two suns. Paralyzed, I watched in horror as an army of dwarves riding wolves bore down upon me. And then the game ended on a cliffhanger. A screen offered my final statistics and score. Maybe I arrived after the events of 2010? 3 points for the game world. The backstory is original but also pretty silly, the main quest (simply to return home) is uninspiring, and the world is distressingly static–to the point that doors close and re-lock if you leave the screen and return. NPCs give the same hints no matter where you are in the game. It would have been a lot better if it had been structured as a series of quests from the king that in some way helped The Realm while simultaneously helping you find a way home. 2 points for character creation and development. 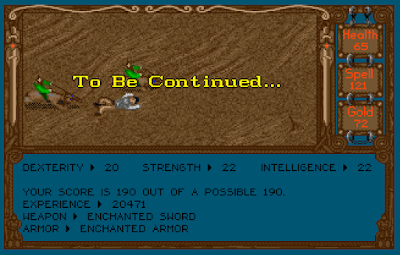 There’s no creation; everyone plays the inane “Major Thom.” The development system has you acquire more hit points and spell points with experience and training, but combats never really seem to get any easier, and development is thus largely unrewarding. 4 points for NPC interaction. There are scattered NPCs–far less than you would expect in a world of this size–who impart information about The Realm and help you with the quest. As noted before, they’re quite static, and there’s no opportunity for role-playing in your dialogues with them. The game’s few NPCs are useful but one-way. 3 points for encounters and foes. The small list of monsters is unimaginative, and the monsters themselves mostly indistinguishable except by graphic. The respawn rate really kills the fun of exploration. 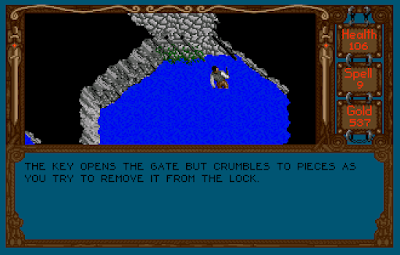 Puzzles are mostly of the inventory type, although there a couple of exceptions, such as opening the way to the Druid Temple. 3 points for magic and combat, mostly for the magic. 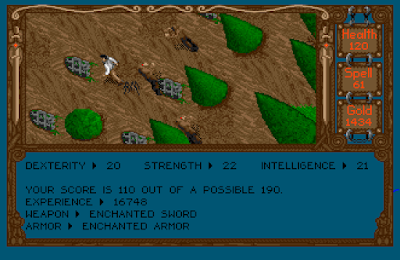 The combat system was awful–a bunch of sword-waving, rendered ineffectual if you’re slightly offset from your foe. 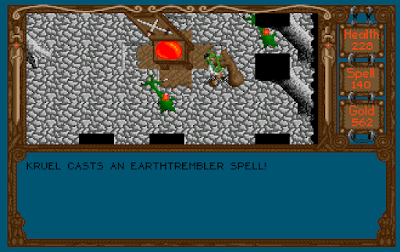 Magic is more useful for exploration than combat, but I thought some of the spells were original. 4 points for equipment. There are a few weapon and armor upgrades and spells, and I like that some items can be used on others in creative ways (e.g., applying poison potions to weapons) and that “examining” items gives you a basic description. There are a lot of red herrings–I ended the game with wyvern eggs, bones, fossils, jewels, incense, and other items that I guess you were just meant to sell for gold. It’s a rare game in the era that allows for interactions between items. 6 points for economy. It remains strong to the end. After you’ve bought everything, bribed everyone, and taken all the courses, you can still stock up on healing and magic potions, which never stop being useful. 3 points for a main quest with multiple stages, but no role-playing, decisions, alternate outcomes, or side-quests. 5 points for graphics, sound, and interface. The graphics are pretty good, particularly when depicting indoor areas. I didn’t care for the constant vibraphone-like music, and the sound effects were sparse, but there were some nice background effects like chirping birds in the forest. The joystick control was sufferable given the many keyboard options. To me, the indoor graphics are the best-looking part of the game. 4 points for gameplay. It’s geographically nonlinear but very linear in plot. It’s not very long, but still longer than it needs to be. 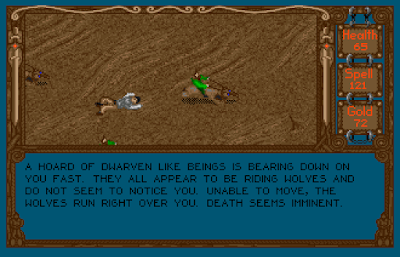 The overall difficulty is moderate. It’s not replayable at all. That gives us a final score of 37, so I guess I liked it just enough to recommend it–a little. The developer did fix some of the problems with the Faery Tale Adventure approach. Notably, the world isn’t quite as large or empty (though it’s still large and empty), and it has a better inventory system. The box art would seem to be depicting the end of the game. Owing to its obscurity today–it escaped MobyGames and Wikipedia, which is unusual for a post-1990 title–I’m guessing it didn’t sell very well. (The failure to develop the promised sequel is another clue.) 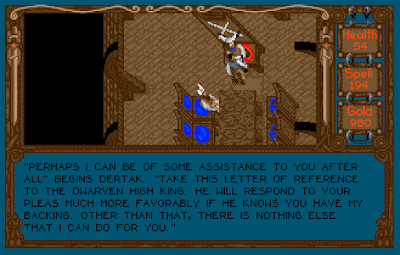 The best review (87%) came from the September 1992 Amiga Action, which called it a “little gem” and offered a review that repeatedly suggests a greater depth of gameplay than actually exists in the game, particularly in the image captions. It got 78% from Amiga Mania, 53% from Amiga Power, and 45% from Amiga Joker. Hollyware Entertainment had been formed in 1991 by David Boyles, a former MicroIllusions employee, after the bankruptcy of MicroIllusions. In his history of the failure of MicroIllusions, Jimmy Maher suggests that Hollyware’s raison d’etre was to sue Activision for things that happened during the MicroIllusions era. Certainly, the new developer wasn’t very prolific. 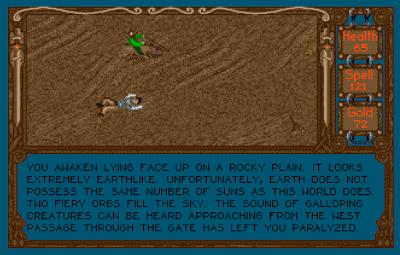 Besides Lords of Time, they seem to have published only two action games–Hoi (1992) and Jonny Quest: Curse of the Mayan Warriors (1993)–and the puzzle game Gear Works (1992). Oddly, the company still exists, or at least re-exists, as Hollyware Transmedia, which is apparently working on virtual reality software. I’m not entirely sure how the rights to Faery Tale Adventure made its way to The Dreamer’s Guild in time for Halls of the Dead: Faery Tale Adventure II (1997), but we’ll sort that out when the time comes. Developer Steve Postma is the biggest mystery here. 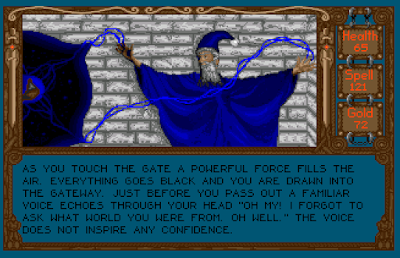 He has sole credit for programming, design, graphics, music, and sound effects–the only other names are associated with just the manual and game box. He has no other video games to his credit. I can’t find him now. Where did he come from? Where did he go? Maybe he’ll Google himself one day, see this review, and pop by to answer the most important question of all: why is the game called Lords of Time? PREVIOUS POST Previous post: XRacing – MSXdev’18 top down racer due to be released very soon!